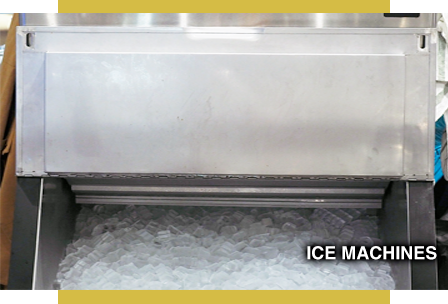 When you are in need of Ice Machine or Low Temp Refrigeration equipment or services, we provide quick, reliable and cost-efficient solutions. 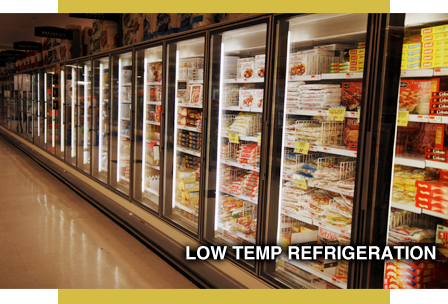 Count on our friendly, certified and professional team to give you the refrigeration you need. There are several problems that can prevent having a reliable ice supply. How many are you experiencing? Since there are strict environmental regulations for food storage in the Coachella Valley, working with us will ensure that your cold storage areas are in compliance with all the codes. We will let you know if yours are in compliance. If not, we will be happy to help you. In addition, let us work with you to prevent the tremendous costs and inconvenience associated with spoilage. We are highly-qualified to evaluate and service any type of Low Temp Refrigeration system to ensure it provides reliable and energy-efficient performance for your beverages and perishable goods – all at the lowest cost. ● Do you need a walk-in freezer for your new restaurant? ● Is your current freezer not working properly? ● Would you like to have a new food display cabinet? ● The diagnosis and resolution of every HVAC issue that comes our way, regardless of complexity. courtesy. All of them are certified and licensed. work to keep the price within your budget. hundreds of dollars in annual utility costs. the efficiency, reliability and longevity of your equipment. • A multi-point inspection of all electrical, mechanical, refrigeration and heating components. ● Expert advice on how to keep your HVAC system in top working order. ● Replacement Equipment for all your HVAC needs.